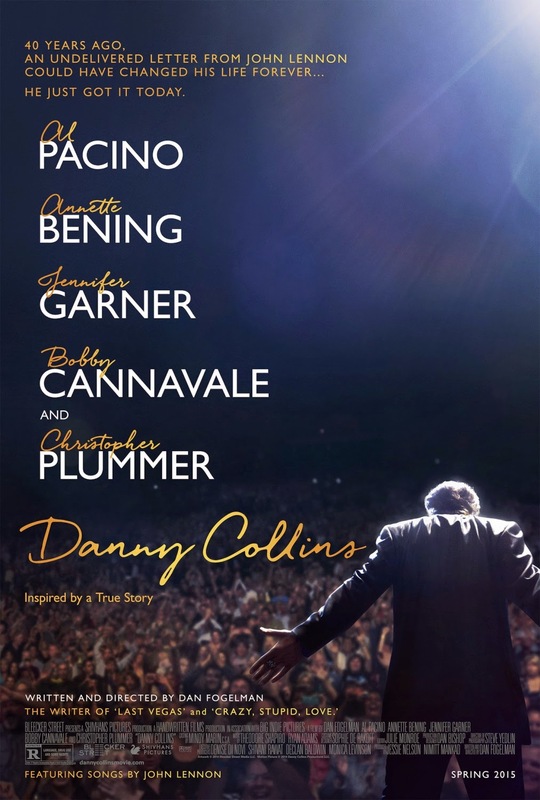 You may know Al Pacino best as The Godfather, but he takes on a different sort of role in Danny Collins: that of an aging rock star, who hasn't written an original song in over 30 years. Pacino and the supporting cast carry this movie, and it ends up being a fun film that also has some seriousness to it. Danny Collins (Pacino) is engaged to a woman half his age (who will be his 3rd wife) but can always count on great advice from his manager, Frank (Christopher Plummer). Danny decides he wants to cancel his tour and take some time off, perhaps to write some original songs, and he holes up at a Hilton in New Jersey. Everyone at the hotel is enamored with Danny except the hotel manager, Mary Sinclair (Annette Bening), although she eventually grows to like him. Another reason Danny chooses New Jersey is that his son, Tom (Bobby Cannavale), whom he's never met, lives nearby, along with his wife (Jennifer Garner) and young daughter, Hope (Gisele Eisenberg). Danny must figure out what he wants to do with his life, along with what's most important to him: stardom or playing songs that actually mean something to him. Pacino was fantastic in this film, but the rest of the cast can't be overlooked either: Christopher Plummer as his aging manager; Bobby Cannavale as his son, along with Jennifer Garner as the son's wife; and their little girl (Gisele Eisenberg) who often steals the show. Annette Bening is a worthy foil for Pacino, too, and their "patter," as his character calls it, is often laugh-out-loud funny. Josh Peck and Melissa Benoist also have supporting roles as two hotel employees: a bellman and front desk person, respectively. Yes, definitely see this movie. It's "kinda, sorta" based on a true story, as the film advises us from the beginning, of Steve Tilston, a folk artist who received a letter from John Lennon when he was young - except, he never did, because Lennon didn't send the letter directly to his house, but rather care of a magazine where Tilston did an interview. The same thing happens to Pacino's character in this film, and it makes him evaluate his life and what it could have been had he actually received the letter when he was supposed to receive it. The film is rated R (probably for language and some drug use, I'd guess), so it isn't appropriate for the younger set, but adults will get a kick out of seeing Pacino playing a rock star - with some good singing too, I'd add! - and the movie is overall one that should do well. Danny Collins is in theaters today, April 3rd, and is rated R with a runtime of 106 minutes. 4 stars out of 5.